A Tootsie reboot in 2018 probably isn’t a good idea. The premise of the beloved 1982 film—in which a struggling actor (played by Dustin Hoffman) disguises himself as a woman, wins a role on a daytime soap opera and becomes a national sensation—seems quaint or worse: The notion that the best woman for the job might just be a man is a joke that’s lost its punchline. 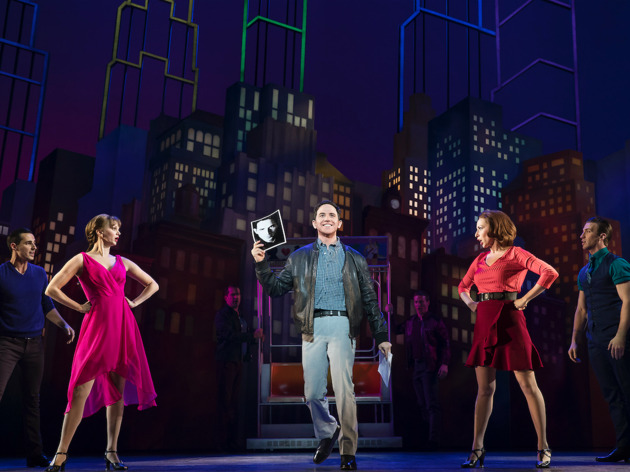 Yet the Broadway-bound musical Tootsie, directed by Scott Ellis and starring the magnificent Santino Fontana, is nothing less than a delight. The story of diva actor Michael Dorsey and his alter ego Dorothy Michaels may not win any awards for wokeness, but it has been tweaked with a modern sensibility that gives it license to do what Tootsie does best: be outrageously funny. None of it this would work without Fontana. He inhabits Dorothy with deadly seriousness; she is a true-blue leading lady (and a dead ringer for Dana Carvey’s Church Lady). But he doesn’t let the selfish Michael off the hook—and neither does the script, which significantly reworks the story’s final stretch in one of many welcome updates from the film. Fontana receives rock-solid support from the rest of the cast. Lilli Cooper plays Julie— Dorothy’s costar and Michael’s love interest—with warm, weary cynicism, and Andy Grotelueschen displays impeccably flexible comedic timing as Michael’s roommate, a slacker Jiminy Cricket. Reg Rogers is louche perfection as the show’s slimy director, John Behlmann plays its reality-TV–star headliner as a truly magnificent dolt, and Sarah Stiles shines as Michael’s friend Sandy, the encapsulation of every sad, nervous actor you’ve ever met. That David Yazbek’s score is superb shouldn’t be surprising—he just won a well-earned Tony Award for The Band’s Visit—but it’s a cut well above the typical intellectual-property cash-in that one expects from shows like this. In witty and surprising couplets, his lyrics tease out the neurotic, obsessive nature of theater folk, and his loping melodies are a welcome respite from American Idol-style pop wailing. There are still some ways in which Tootsie, by its very nature, can make a modern audience cringe. But if a Tootsie musical is going to exist, we’re lucky it’s this one. It may not be a good idea, but it’s a damn good show. Cadillac Palace Theatre. Music and Lyrics by David Yazbek. Book by Robert Horn. Directed by Scott Ellis. 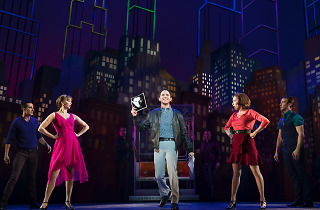 Starring Santino Fontana, Lilli Cooper, John Behlman, Andy Grotelueschen, Reg Rogers, Sarah Stiles and ensemble cast. Running time: 2hrs; 30 min. One intermission.